Winters in India can be very chilling as the temperature falls a lot during the winters. Most of the Indian homes have electric geysers to heat the water but sometimes it can be a problem too. For example, the students living away from home might not have a geyser as geyser can be expensive and at the same time, it is not portable. 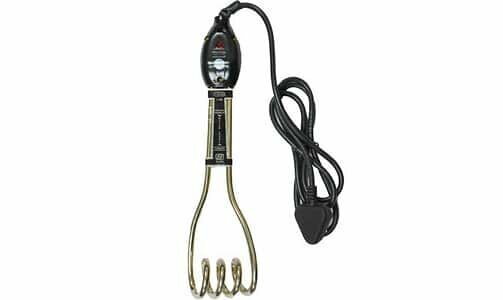 In such a case, a water immersion rod can prove to be really handy as the rod is compact in size and it is quite economical to purchase one. 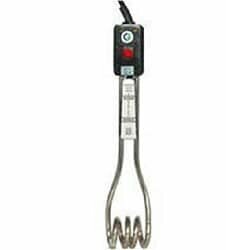 In this article, we have listed the best immersion rods which are available in Indian market. Read along as we look through the ‘5 Best Immersion Rods in India with Price 2017’. On 5th rank, we have an immersion rod from Bajaj. The rod is quite durable and because of the high power, the rod quickly heats the water. The rod has plastic insulation on the top which makes it easy to handle and the rod is also easy to clip to the bucket while heating water. Products manufactured by Crompton are quite durable and this heating rod proves the same. The rod comes with a years warranty and the rod has a tubular element which provides higher heating capabilities. 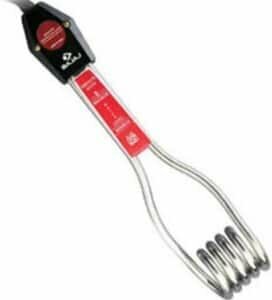 The immersion rod is shock proof and hence it is also safe to use this immersion rod. Next on our list is this immersion rod from Murphy. The main advantage of this rod is that the heating material is made of steel and hence it is protected against the corrosion caused by heating the hard water. The rod is easy to use and it comes with a 6-month manufacturer warranty. The model comes in a package of two and hence this is one of the cheapest immersion rods in our list. Coming to 2nd number, we have an immersion rod from Usha. The power consumption of this rod is 1500 W and the rod is quick in heating a bucket full of water. The brand name also ensures a durable product. On the first place, we have a heating rod from V-Guard. 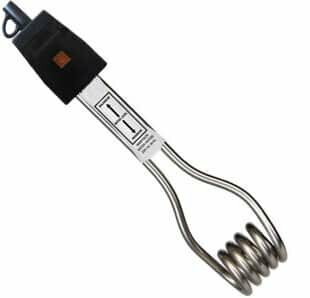 This model of immersion rod comes with a copper based heating element which quickly gets heated up and the rod turns out to be quite efficient as copper is one of the best conduct of heat.